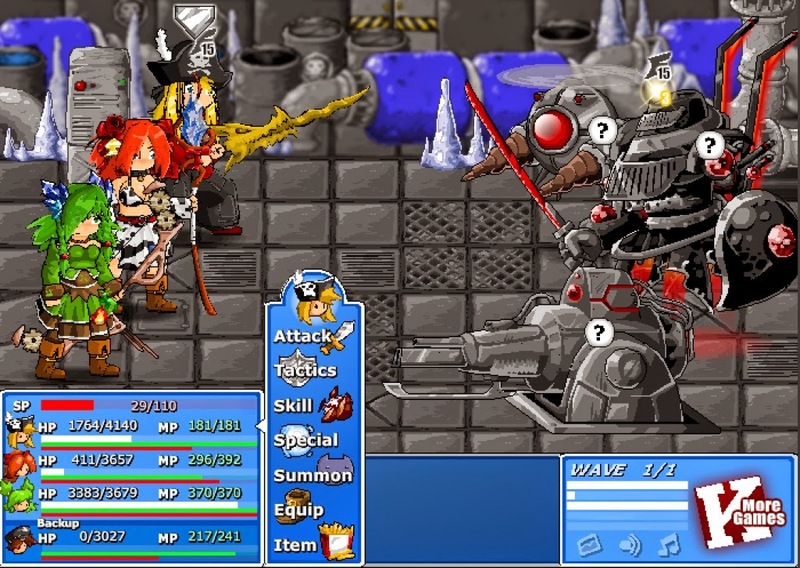 The Epic Battle Fantasy crew has a long way to go before they reach the end of the mystery of the missing jewels, and far too many times now they've been hampered by rocks. They may be able to mash monsters made of rock, but busting rocks outside of battle is another matter. They need a Hammer, and someone supposedly has one inside the Waste Disposal Plant. Plug your noses and dive in, brave warriors! Inside the entrance of the Plant a worker will tell you that a rogue AI has seized control of the Plant's robots and is locking out many of the doors. Great. Lightning will work quite well in here, so equip your troops appropriately. Natalie's Thunderstorm attack is great within these walls. You can also use Bomb attacks to equal effect (though you're less likely to have developed them, more than likely). Hit the north switch in the next room to start to swap the positioning of the spikes in the floor. There's another switch to move spikes, but you can't open the lock it unblocks, so don't bother. Kill the enemies here an check the chests for Solar Flare, five Glasses, two Silks, two Bio Viruses, two Curly Horns, two Solid Spikes, a Donut and a Beef. The next section to the east has another switch. Kill the enemies, hit it, and check the chests for twelve Microcontrollers, one Ham, two Pineapples, ten Hand Bombs, ten Gunpowders, four 7-Segment Displays, a Thunder Core (great for Lance in here if you use him regularly), seven Springy Springs and twelve Red LEDs. Exploring the Waste Disposal Plant. Check the cabinet in the next room to the east for twelve Red LEDs and two Glasses, Kill off the enemies and check the chests for an Iron Cross, seven Iron Ores, sixteen Microcontrollers, five Glasses, three Plastics and one Pink Potion. The Iron Cross is particularly good for resisting attacks in this area. The next area to the south isn't much different from this. 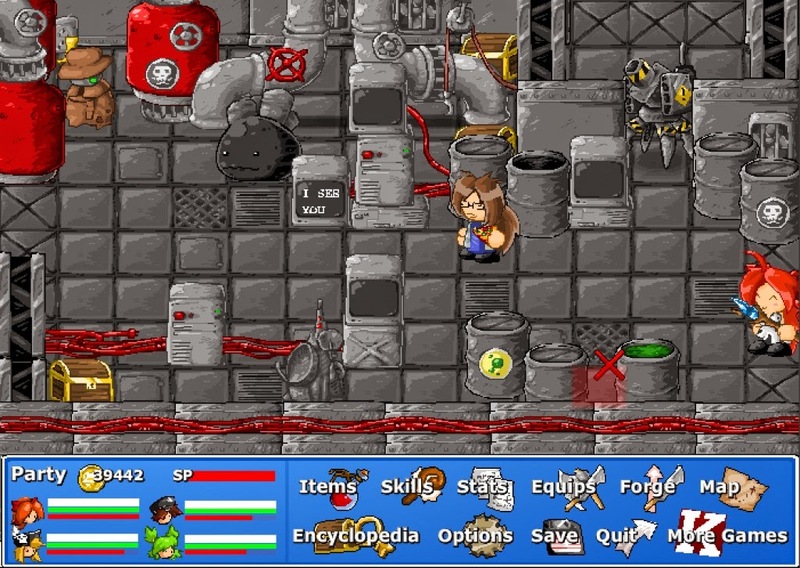 Kill the enemies, collect the two treasure chests (don't forget the one in the top-left corner, behind the enemy) for a Lollipop, a Silver Plate, four Steel Plates, a Gas Mask and five Glasses. You'll get the other two shortly. West of here is another similar section. Go immediately north of the entrance to fight a strong (but not that strong) Defender, and beyond it a path to two switches. Open them if you want, but go back south into the previous room for now. 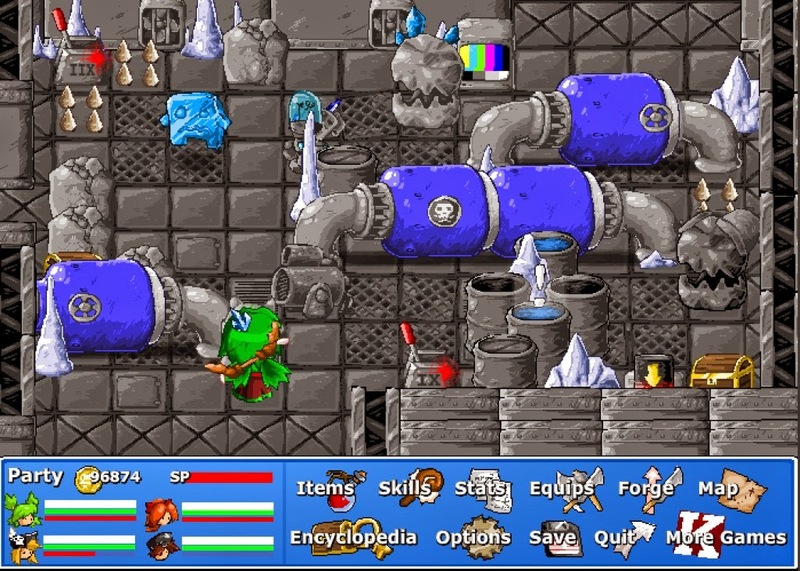 Beat up the enemies here and collect the three chests (which you can reach, despite how it looks - just click in front of the northernmost two to get to them) for a Space Suit, five Plastics, three Glasses, one Diamond Pin, two Bio Viruses, one Steel Key, four Steel Plates and one Lollipop. Be sure to check the ooze-filled barrel in the south for two more Bio Viruses and seven Seaweeds, as well. Still exploring the Waste Disposal Plant. Oooo, could that TV monitor be of use? Maybe? Possibly? Head to the room with the two switches that opened two doors and go north. You're now looking at the sludge that makes this place a Waste Disposal Plant. The enemies here have changed up a bit, but aside from the Yellow Jellies they're still vulnerable to Lightning attacks. Swap for Ice or Poison on the Jellies as you make your way to the east. (This is a great place to get AP, if you hadn't noticed for yourself.) One chest requires a bridge you don't have; the other contains Debilitate, two Bio Viruses and nine Seaweeds. Now that you have another Silver Key, return to the room with the green sludge and take the northern path. Clear out the enemies - be especially wary of the Defenders, the two of them will take a long time to whittle down and they can hit pretty hard - and check the chest in the open for a Honeycomb, six Beers and six Garlics and the one behind the lock for Ion Cannon and a Plasma Ball. Place the two Batteries in the slots here to open the door and grab the Battery inside, then grab the other two you placed. Return to the room with the Slime Bunny basket and head one room north. Kill off the enemies (the vast majority are lightning-elemental and will fall easily to Earth magic and attacks) and check the chests for a Camo Skirt, two Silks, two Bubble Stones, Thunder Elemental, a Plasma Ball, a Topaz, five Rainbow Gems and a Cake. You'll also find another Plasma Ball and three 7-Segments Displays in the top-right cupboard. Put the three Batteries you have in the slots to get through the northern door. There's a Slime Cat transport spot right beside where you come into the next room, and the enemies will change to icier prey. Fire attacks will become much more useful. Hit the switch to your right to lower the spikes in the top-left corner of the room, clear the space of enemies, and grab the items in here: a Battery, a Mini Bomber, a Donut and a Candycane. You can also find a RAM Chip and twelve Hand Bombs in the cluster of four barrels near the Battery. Be prepared for quite a fight against the Ice Golem - you'll have to face two at once in the second wave, and they have a ton of HP. Fire is your friend, as is constant healing. Resistance against getting frozen via the Frost Badge is invaluable. The next room is quite straightforward, as you can't access the large central chamber just yet. Grab the Battery from the northwest corner and defeat the monster here to get at a chest containing a Steel Key, a RAM Chip and 22 Microcontrollers. You can continue west, but for now it leads to a dead end. Backtrack through the Plant to the room with five Battery slots, grabbing the three installed along the way. Put all five Batteries in these slots and you'll open up one final chamber containing a boss, the mighty Praetorian. Battle time! The Praetorian, lord of the Waste Disposal Plant. Scan this beast and the amount of HP it has will probably scare you. Nevertheless, you need to start by taking out the two Laser Cannons flanking the Praetorian. Electricity has retaken its role of prominence in this fight, and you shouldn't hold back one bit blasting away at them. Praetorian swaps between brutal physical attacks and the occasional electrical attack, most of them all-hitting your team. This gets especially bad when Praetorian buffs itself and sends its attack skyrocketing. If you can, immediately debuff it to sap its newfound strength. You want to be able to Dispel, because Praetorian will keep buffing itself and eventually become way too tough to kill. Thunder Elemental is a great summon for getting through the fight, as it can annihilate the cronies quickly when they appear and do a ton of damage to Praetorian as well. Beat the Praetorian and you'll earn a RAM Chip, a Plutonium Core, a 7-Segments-Display and a variety of other items from it and the other enemies you took out. The destruction of the Praetorian will open up a bunch of treasure chests, though to get at them you'll have to take the Hammer from the one open chest. At long last! (You'll also get a Ham and twelve Steel Plates from this box.) Smash through the boulders here to get, aside from the medal Use Rock Smash, a Steel Key, a Cake, eight Plastics, seven Coffees, one RAM Chip, seven Silks, one Pizza, one Hamburger, one Chips, a Thor's Hammer, a Plasma Ball, a Topaz, an Orange Juice, six Coffees, eight Cupcakes, a Gold Plate, two Silver Plates and four Rainbow Gems. You can also smash through the rocks on the left side of the room to reach Crystal Cavern, a short jump from Whitefall Town. Wooooo! With the Hammer in hand your prospects for traversing the world are now significantly greater, and you can progress on your journey with ease. You can also use the Hammer to check out old areas and get new items. You can also check out the entirety of Graybone Cemetery with the Hammer in hand. We'll head there first.